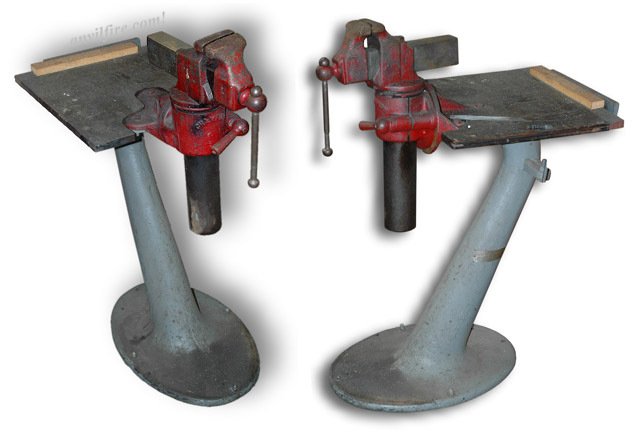 When I was a kid growing up this was our "big" shop vise and at that time I thought it was the biggest one made! And weight wise it IS a big vise, otherwise it is a strange bench vise. The last time I used it at home was when I was about 13 and my best friend and I were using it to hold a small lawn mower motor we were testing. We didn't have a return spring on the throttle and it took off and ran for less than 2 seconds and BAM! It threw the rod, broke the head off the piston and what was left of the rod was the most gracefully accordianed metal I have ever seen. Don't YOU have a story about every tool in your shop? That's why I have a hard time parting with ANY of them - they are like my family and are definitely my history. The stand shown above is another oddity, it is NOT a vise stand, its the base of a heavy commercial ironing board from the late 1800's. It came from the Old Crutchfield's Laundry and Dry Cleaners in Lynchburg, VA. - Another story. . . Made by Western Tool & Mfg Co, Springfield, Ohio. This vise has a covered screw and forged on handle balls. LOOK at the wear on the lower couple inches of the handle! 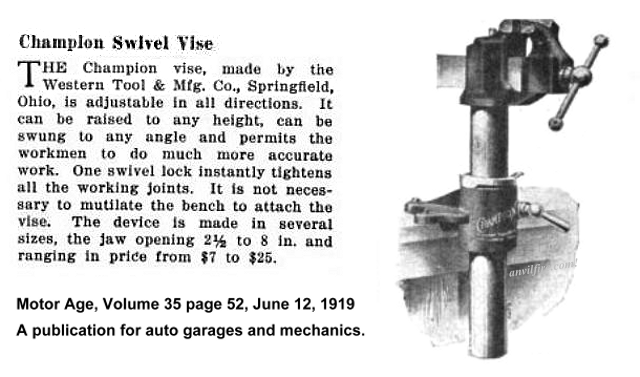 I have wondered about that for years and now realize that the vise must have been one of those mounted on a vehicle and the thousands of miles of vibration wore the handle. . . Imagine what stories an old tool like THIS could tell. . . The single lever on the front unlocks the column and rotation mechanism. 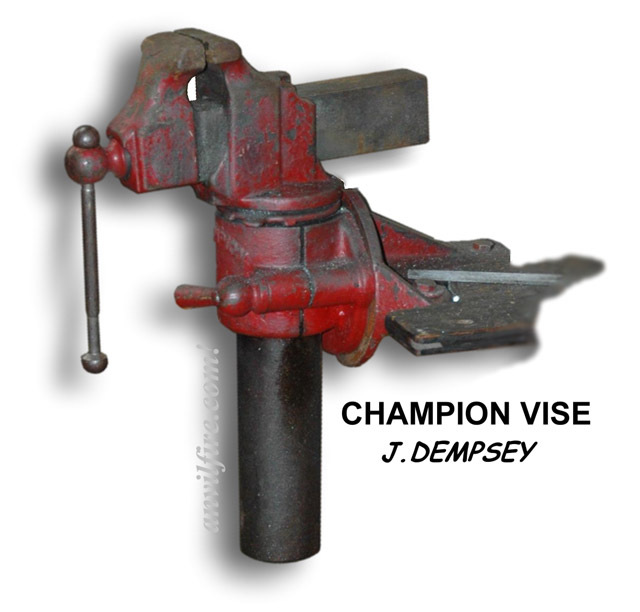 The vise can be raised over a foot and rotated 360 degrees vertically and horizontally (all directions).